A Waste-to-Energy Plant is a waste management system where waste is burnt to produce electricity. These plants usually burn municipal waste. The various techniques used in Waste-to-Energy (WTE) plants are biomethanation, combustion, gasification, pyrolysis. Non-recyclable and not-hazardous wastes should ideally be burnt in this process. The waste to energy plants comparatively release less pollution than a coal-based plant. 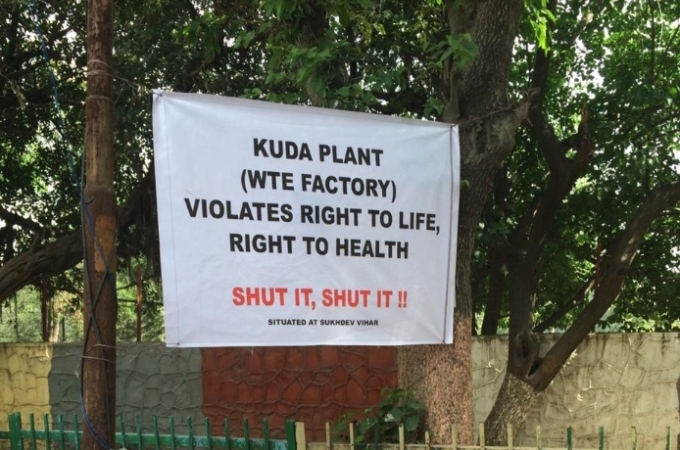 Recently, residents of Okhla region and nearby areas in Delhi have been protesting against WTE plants in their vicinity. Why India Urgently Needs a Waste Management Plan? Increasing urbanization and industrialization has paved the way for greater economic growth in India. This is only augmented by increasing purchasing power of the average citizen. Simultaneously however, migration to cities, rapid and often, unplanned urbanization, increased burden on land and lack of information and awareness about waste disposal in cities is resulting in mismanagement of waste and dumping of large piles of waste in the open. Such huge mountains of trash at landfill sites, time and again catch fire. These sites not only decrease the quality of life of the nearby residents and wildlife but also pose serious safety, health and environmental threats, often leading to hazardous situations. Fires at these sites further aggravate the problem of air toxicity, contamination of soil and groundwater. Unscientific dumping of waste and the resulting challenges are one of the major problems in metropolitan cities. Reduction in waste generation and proper management of waste have become essential for combating the problem of rising waste menace. As a result, one of the solutions being pitched is the setting up of WTE Plants. Is Waste to Energy Feasible? Waste to Energy plants are being presented as a potential solution to the problem of increasing landfills. At the outset, WTE plants indeed offer a technologically advanced solution by converting solid waste to energy in an ecological manner. They help mitigate risks associated with waste disposal, decrease carbon emissions, recycle metals and provide clean energy. However, the most essential requirement for efficient functioning of a WTE plant is segregation of waste. Regretfully, we have not been able to achieve success on this front so far. Waste collected in India is unsegregated. Further, it has low calorific value and high content of inert materials like sand and concrete. This makes the Indian waste unsuitable for burning in WTE plants. The cost of maintaining a WTE plant, even after subsidies is more than a traditional coal plant. This is certainly a disincentive for the energy sector companies. Hence, feasibility of a WTE plant in India is a major concern. The above reasons have even led to shut down of WTE plants in cities such as Bengaluru, Karimnagar, Lucknow and even in Delhi in the past. Since WTE Plant seems to be the only viable option for landfill reduction, the idea is being supported by the Ministry of New and Renewable Energy (MNRE) of the Government of India. MNRE, under the Swachh Bharat Mission is working on 40 such projects which will have a total installed capacity of 344 MW. The Government of India is ready to provide financial assistance depending upon the size of the plant. For the power generation from Municipal Solid Waste (MSW), Central Financial Assistance (CFA) would be given in the form of capital subsidies which would be calculated on the basis of installed capacities. The incentives are set to increase in near future as there are increasing concerns over the landfills and the public health threat that they pose. The Government and the MCD in Delhi are also taking various steps to ensure that waste is segregated at the household level. There are 5 municipal authorities in Delhi and the total waste generated is 9,260 tons/day. Further, there are 4 deposing facilities in Delhi at Bhalswa, Gazipur, Okhla and Narela Bawana. As per data collected from Department of Environment, Government of NCT of Delhi, there are 3 operational waste to energy plants in Delhi. These are Okhla (16MW), Ghazipur (12MW), and Bawana (24MW) and have a total waste handling capacity of around 5,100 MTD. Why are Some Residents in Delhi Protesting? Residents movement against WTE plant are on the rise, especially in Delhi. 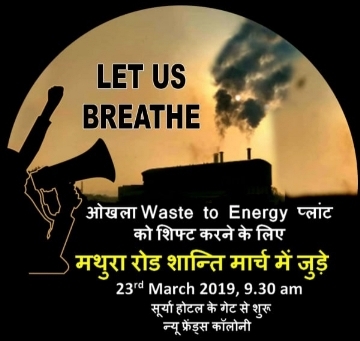 Residents from South Delhi areas of Sukhdev Vihar and Jasola have in fact called for a protest on 23 March 2019 against the setting up of Waste-to-Energy Plant in their vicinity. This, according to them, has become a serious health hazard for them. In January of this year, residents of Jasola also conducted a similar protest against the Okhla WTE plant. The plant has been a cause of concern for the residents living in nearby areas. Residents are reporting complaints of severe illnesses due to harmful emissions coming from the plant. The emissions have even forced the locals of these areas to think about relocating themselves. Delhi Greens spoke to some of the residents in Sukhdev Vihar and Jasola localities. One of the protestors mentioned that the plant burns unsegregated waste which includes batteries, harmful chemicals, CFLs, pesticides, computer equipment which is the cause of excessive pollution in the area. The ashes from the burnt waste are carried away by air and spread across the locality, added another resident. Residents demand that the plant should be shut down. In 2017, the National Green Tribunal had charged an ‘environment compensation’ of Rs 25 lakh for deficient operation of this Plant. The NGT had however allowed its functioning with certain provisions such as the increase in the green belt, monthly inspections, use bricks manufactured from the fly ash. Why is WTE Not Succeeding in India? Waste to energy is not that successful in India as compared to Germany and other countries since the composition and quality of waste in India is not compatible to the waste that is needed to run an energy plant. In India, the waste is not suitable to burn as it has low calorific value and high moisture content. Beside, since waste collected is not segregated, it should not be burnt at all. The technology used in the waste to energy plant is mostly imported which increases the cost of the plant. Lack of funds with the municipal bodies, proper policy and purchasing power. Unsegregated waste is one of the major stoppages for these plants. Urban India urgently needs to reduce the quantity of waste generated and also ensure waste segregation at source, i.e. at the household level. The waste which meet the criteria as given in the Solid Waste Management Rules 2016 should only be used. WTE can provide the dual benefit of exhausting waste and generating large quantity of energy. Simultaneously, it can also help in the reduction of air and water pollution. But its implementation has to done carefully after ensuring it does not cause any threat to public health in any way. Chaman is pursuing Bachelors in Journalism from the University of Delhi and is a firm believer that words of wisdom can enlighten the masses and bring positive social change. Informative and to the point. Well researched. Down with waste burning plants.